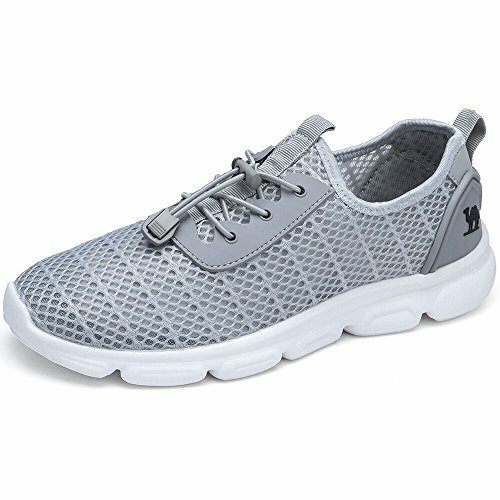 【Unique Apperance】:Full coverage design .Made of mesh fabric , Single Layer.evenly wrap your feet to fit your feet and protect your feet much better. Open Mesh on the upper and hole on the sole provides for breathability and quick drying, Help you feet feel comfortable. 【Easy to wear or take off】: The casual shoes of closure which design by Elastic band, you can easy to adjust the elastic band .wrinkle free and without peculiar smell, suitable for all kinds of weather, Camel running shoes walk through all the seasons with you. 【Extremely Lightweight】:It\'s as light as your phone and gives you the comfort of bare feet. A lightweight walking shoe can release you all stress. Adopt sneakers shoes flat design standard, fashion and leisure of the running shoes. 【Outsole Design】:MD Rubber sole with 9 high buffer column. Toughness. Bendable flexible . Shock-proof, It\'s good for your foot healthy while in walking.soft insole is comfortable and cushion. 【Widely Occasion】:Fashion wear ,causal style work, school, exercises, home, party. daily life sports outdoor any occasion.